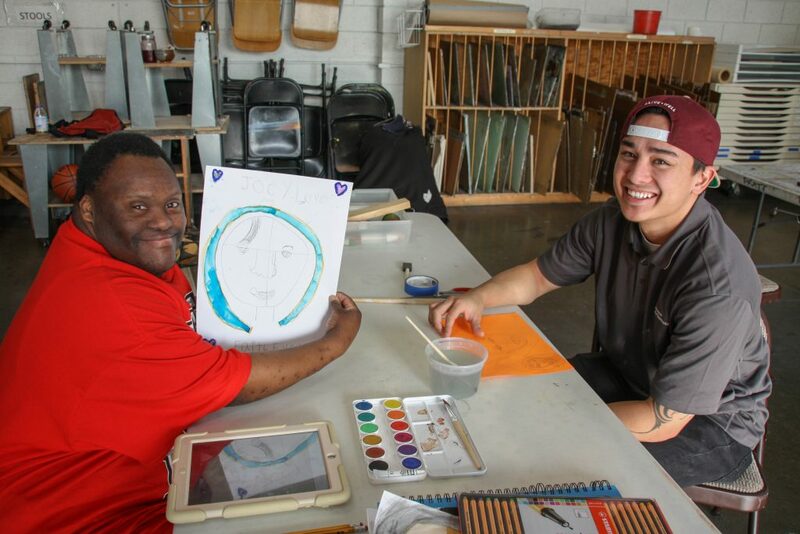 At Vibrant Palette Arts Center, we believe developing friendships with artists of all strengths and abilities is a necessity for creating an inclusive art community in Seattle. The Peer Artist program is our way of creating that inclusive space. To become a Peer Artist, you will need to complete a background check and make a one time donation of $15 to cover the cost through our fiscal sponsor, CascadiaNow! The cost to participate in the program is $25 per day, which allows you access to all of Vibrant Palette’s materials and space, but does not include access to our art instructors. Vibrant Palette Arts Center will not exhibit Peer Artists’ work at our public art shows, unless a collaborative project was done with one of the Vibrant Palette artists. Admissions into the Peer Artist program will be based on the current amount of VPAC artists we have enrolled in the program. Contact info@vibrantpalette.org to become involved in our Peer Artist program!